Yesterday morning, the Senate Government Oversight Committee adopted an amendment to Sub House Bill 228 that gutted the chief objective of the bill, which was to remove one’s “duty to retreat” from a violent attacker. The gutted bill then moved to the Senate Floor, passed, went to the House for a concurrence vote, and now waits a signature, veto or no-action from Governor Kasich. As gun owners across our state know, the pinnacle of any self-defense reform is the removal of the absurd requirement to retreat from a felony attacker. The are several reasons why the “duty to retreat” repealer in Sub-HB228 was gutted, leaving a knife in gun owners’ backs. One major reason was because of the promise of Governor John Kasich’s veto. You see, gun owners knew all along that Governor Kasich meant every word in his continuous rants to the media that he wanted gun-control passed and would veto any Stand-Your-Ground law that might land on his desk. And that’s why Ohio Gun Owners worked so hard, starting back in September, to get the various gun-groups in Ohio on the same page, because we knew that ANY Stand-Your-Ground language that passed would come down to a veto-override. A veto-override is a legislative session where a legislature takes up legislation vetoed (aka: rejected) by a governor and passes it AGAIN, with the constitutional number of votes to force the legislation into law anyway. That’s why Ohio Gun Owners quickly coalesced with Ohioans for Concealed Carry (OFCC) and Ohio Carry (OC). Throughout the late summer and early fall, it became apparent that Sub-HB228 was going to be “the gun bill” that the legislature acted on in lame duck session. Knowing this, Ohio Gun Owners got together with OFCC and OC to draft an amendment to Sub-HB228 that beefed up the ill-written self-defense portions of the bill. And gun owners across Ohio already know what that amendment looked like. The first iteration of it was termed the “Zeltwanger Amendment,” when Representative Paul Zeltwanger tried to run it in the House Federalism Committee last summer. Then it became the “Vitale Amendment,” when Representative Nino Vitale, backed by Representatives Tom Brinkman and Candice Keller, tried to run it as a Floor Amendment during the full House floor vote on Sub-HB228. Most recently it became the “Jordan Amendment” when Senator Kris Jordan tried to run it in the Senate Government Oversight Committee during this week’s hearings on Sub-HB228. Though it seemed an uphill battle throughout the process, we kept pressing the issue, rallying our members and supporters around it because we knew that Sub-HB228 was vulnerable. HB228 was drafted by Representatives Sarah LaTourette (who admittedly doesn’t have a CHL or carry a firearm for self-defense) and Terry Johnson under the direction of Buckeye Firearms President Jim Irvine. OGO was not involved in this. In fact, until the very last committee hearing in the House Federalism Committee, we did not lobby in favor of the bill nor offer testimony in support of the bill. ➜ It didn’t fully address and fix Ohio’s self-defense laws properly. ➜ It didn’t fully address and fix Ohio’s preemption statute properly. ➜ It didn’t fully address and protect gun owners from prosecutorial bias properly. In fact, HB228 was written as a dreaded omnibus bill, nearly 80 pages long – a mile wide and an inch deep that touched many issues but addressing none of them well or sufficiently. In other words, it was completely watered down, just the way politicians like it. American conservatives and gun-owners nationwide historically oppose the idea of omnibus bills, as they are favorite tool in the arsenal of the radical left. On the conservative right, specifically, omnibus bills are NOTORIOUS for taking on huge amounts of opposition, making final passage extremely difficult, and veto-overrides nigh impossible. That’s why we didn’t immediately jump on board this bill. Nevertheless, Sub-HB228 did repeal Ohio’s “duty to retreat” law, and just as important, it didn’t take any actual steps backwards or give up any firearms freedoms, which Buckeye Firearms’ Jim Irvine has signed off on in the past. That’s why Ohio Gun Owners went to work trying to fix the self-defense section of Sub-HB228, so that we could jump on the bill and help hammer it through in a veto-override session. But sadly, Buckeye Firearms Association President Jim Irvine’s ego got in the way. Ohio Gun Owners first got started in early 2016. In early 2017, when OGO was barely a year old, Jim Irvine directed BFA lieutenants Chad Baus and Dean Rieck to attack Ohio Gun Owners, publishing a slanderous hit piece accusing OGO of formulating to block gun rights and encouraging people to “spread the word” about us. When OGO emailed Irvine, Baus and Rieck to invite them to a meeting at a coffee shop anywhere in the state in order to answer their questions, correct their assumptions and get the gun-groups on the same page, Irvine refused. In fact, they all refused. 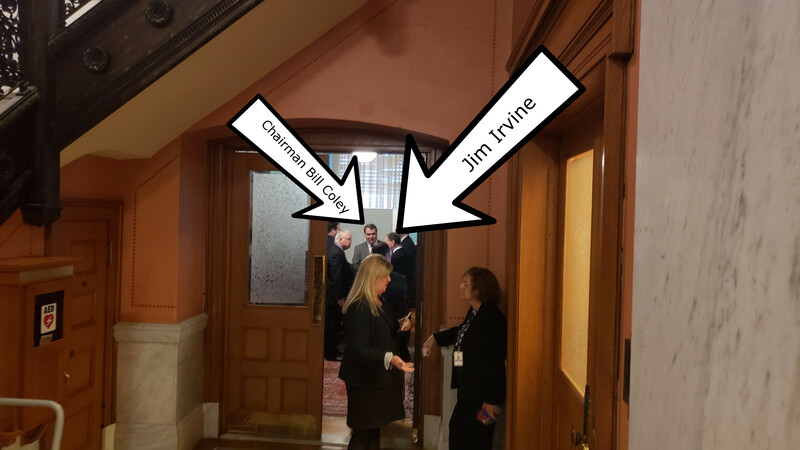 When I personally ran into Jim Irvine during a hearing on HB142 at the Statehouse several weeks later (on May 16, 2017, I believe), Irvine refused again, stating that he didn’t have time and never would have time. Although Buckeye Firearms and Jim Irvine initiated the attack on Ohio Gun Owners, we were still willing to meet to discuss our differences. The reason why is simple: a house divided is easily conquered. Put more bluntly, the pro-gun policies that the members and supporters of Ohio Gun Owners are far more important than a battle of egos, which is why OGO previously came to good terms with Ohioans for Concealed Carry. That is why we went to work trying to fix the deficient portions of Sub-HB228, because our members deserve our BEST efforts and the policy wins those efforts can produce. In our effort to amend Sub-HB228 (Sub-versions of a bill are simply amended versions of the original bill) in the House Federalism Committee, word spread that BFA’s Jim Irvine was urging rejection of our amendment. In our effort to amend Sub-HB228 on the floor of the House, Buckeye Firearms’ Jim Irvine sent out a statewide email urging legislators to REJECT any strengthening floor amendments. By doing so they were giving House Leadership a free-pass to kill the strengthening amendment. In our effort to amend Sub-HB228 in the Senate Government Oversight Committee, Buckeye Firearms went on a Facebook campaign telling people that there wasn’t any time left for amendments, and that they would kill the underlying bill. During this sequence of legislative action, Ohio Gun Owners never gave up. Throughout the Senate Government Oversight Committee Hearings on Sub-HB228, it became clear that Sub-HB228 was in jeopardy because of it’s omnibus status. ➜ Ohio’s biggest and nastiest gun-control lobby, the politicized Fraternal Order of Police union, hammered away at parts of the bill. Ohio Gun Owners joined with Ohioans for Concealed Carry in testifying AGAINST watering down the legislation, and instead urged them to strengthen it! Never once did Buckeye Firearms President Jim Irvine take to the podium to testify on Sub-HB228. Never did he warn the committee AGAINST watering it down. Never did BFA urge their members to contact the committee DEMANDING they not water it down. The reason why is simple: Irvine and Buckeye Firearms Association rely on friendships and endorsements and with the politicians – instead of grassroots engagement and pressure – hoping to curry enough favor to get the outcome they are looking for. Their endorsement/ratings system is designed to try to accomplish this. Since their endorsement/ratings system is the only tool they have in their “arsenal” to get politicians to do what they want, they must BEG the politicians for scraps, and settle for whatever the politicians will give them. This endorsement system has failed spectacularly over the last several years. In other words, all of Bloomberg’s Red-Flag gun confiscation order bill sponsors are all endorsed by Buckeye Firearms Association, and none of them have had their endorsements revoked by Buckeye Firearms Association. So yesterday morning when the press started buzzing about the rumor that the “Stand-Your-Ground” provision of Sub-HB228 was getting gutted, we weren’t shocked. When Senators started confirming those rumors, we weren’t shocked. But when those Senators all vanished into the ante-room behind the Committee chamber, we looked around to find out that BFA’s Jim Irvine had vanished too, and we got curious. Word got out that the deal was “under way,” at that very moment. Clearly not getting an invite, I personally walked with a volunteer around the side hall to get a look through the hall door. Now, in politics, everybody always hears about smoky, back-room deals. This is one of them – sans the smoke. To throw up one final road-block, we asked Senator Kris Jordan to object to unanimous consent for the amendment, forcing on record the committee members who voted against the Stand-Your-Ground provision. Sadly, only Senator Kris Jordan stood firm and voted to repeal the duty to retreat by voting NO on the adoption of the amendment! As we stated above, Sub-HB228 as-gutted then moved to the Senate Floor, passed, went to the House for a concurrence vote, and now waits a signature, veto or no-action from Governor Kasich. The majority, if not all, of the Republicans on the Oversight Committee who voted yesterday to insert the “duty to retreat” back into Sub-HB228 are endorsed by Buckeye Firearms Association. And even though they stabbed gun owners in the back, they’ll keep their Buckeye Firearms Association endorsements! There will be no repercussions from BFA towards the Senators who voted to gut Sub-HB228 because BFA signed off on the deal! They will not revoke endorsements. They will not email their list telling people that Chairman Coley buckled. They will not tell their Facebook audience that moms and dads and grandparents and college daughters still have to try to flee and get away and retreat from rapists, thugs and murderers in Ohio because their endorsed Republican Senator friends made sure of it. They can’t, because Jim Irvine signed off on it. They own it, because Irvine owned it. They made the deal, and instead of holding fast for their members and supporters, refusing to yield, instead they’re now representing the politicians to their members, telling them what they must settle for. So they’ll tell each other how much worse the bill could have been watered down. They’ll convince themselves that the face-slapping they received from their “friends” could’ve been harder. They’ll convince themselves that having the pinnacle objective of Sub-HB228 stripped away from them and given back to Bloomberg’s Moms Demand Action is a win because of the scraps left were thrown to lick up. And then they’ll get back to work buttering up and thanking the Senators for not doing them dirtier. Ohio Gun Owners was organized not even three years ago because the status quo is broken. Looking at the gun-control organizations and their evolving approach to blocking pro-gun bills and passing massive, sweeping gun-control, we knew a 1990’s approach was insufficient for the task. Ohio Gun Owners is based on a model of grassroots mobilization, getting thousands and thousands of gun owners from all corners of Ohio engaged in the fight for our Second Amendment freedom. We mobilize the grassroots, we get new people involved, we push for our legislation aggressively, and if we don’t win we demand payment for betrayals from the politicians at election time. We never compromise our beliefs or our positions, we insist the politicians listen to gun owners’ demands, and if we lose, we work to grow larger, stronger, getting ready for the next fight. We utilize every tool available in our arsenal to accomplish these goals, like direct mail campaigns, mass and targeted email deployments, social media saturation and, someday, paid media. We don’t apologize for our love for the Second Amendment, we’ll never stop fighting, we’ll never back down, and we’ll never betray your trust. So as we gear up for war in the 133rd General Assembly in January, we’d love to have you standing with us. Become a member by joining HERE. P.S. Our Statehouse in Columbus needs some climate change. The only way gun owners don’t get treated the same way in the next General Assembly is if we double or even triple our size as an organization of thousands. If you’re not one already, you’re missing out. Help us grow explosively in 2019 by joining with us now as a member today!